Hello gang at mbworld. I haven't been on this site in more than 10 years I think... I was fairly active when I had my 2005 E55 which is still the pic in my profile. (Since then, I've had 2 M5's, Acura RL, Audi S5, etc, but have been driving a Jeep Rubicon for the last 5 years). 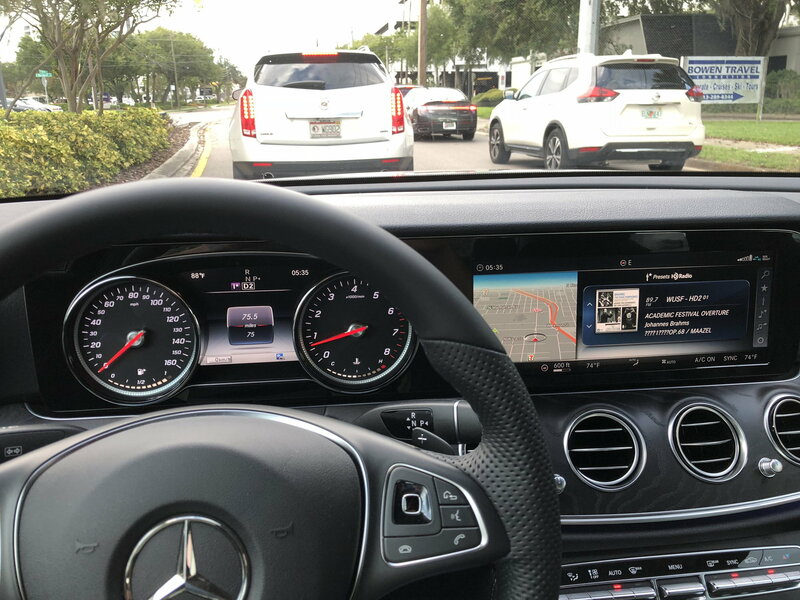 For her A-Service, I drove a 2018, brand new, E300 as the loaner car, and really really really enjoyed it. I'm not sure it's because I've been driving a Jeep Wrangler for so long, but the luxury and ride really impressed me. The interior and comforts in particular blew me away. The accent lighting on the 2017+ is particularly intriguing to me. The ride, although a bit under powered, was very comfortable. My only beef is the power being a bit light... but as I'm aging, I care about that a lot less than I used to. I am planning on buying pre-owend. There are some good deals on 2017's it seems... low mileage, well equipped, decent amount of warranty left for low 40's. 1). Is it worth waiting for the E400? (That means paying new pricing ... not sure it will be that much better) ... somewhat rhetorical as only I can answer whether I should pay for a new vs. pre-owned. 2). Can the 2017's turn off the NFC in the MB menu like the 2018? --- PS. I'm not open to turning off Apple Pay on my phone as a solution, etc. Has anyone used "Carvana"? . I have this car burning a hole in brain... Ugh. Wish I didn't just to save the $$. They just opened a Carvana here in Charlotte, I see a lot of the license plate frames around, so someone is definitely using it, but I don't know anyone who has personally used it. 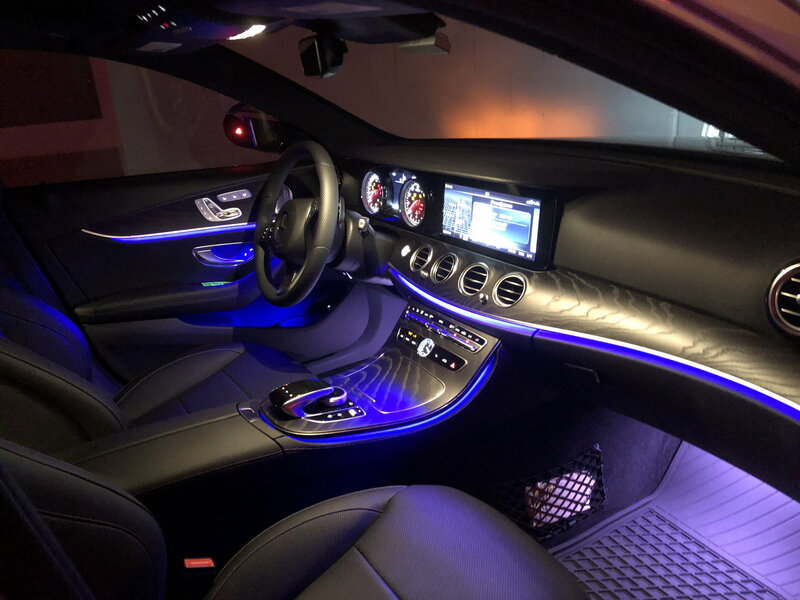 Can only comment on 3) ambient lighting: I have a 2018 E400S with Macchiato Beige/Black leather, and a Macchiato Beige head liner, and the ambient lighting is amazing. Coming from a 5-series I thought it was a bit over the top at 1st, and dialed it down to BMW orange, but pretty soon I was experimenting with the different themes. There's a reason MB uses deep blue as their default ambient light: its unique and really eye catching, without being distracting. ...I have a beige interior too. Lighting looks awesome! Within the last week, we bought a new E300 and a new E400. The E300 is a great car and the engine quiet and responsive enough for my partner. I just wanted the extra oomph of the E400, but I'm sure I could have easily lived with the E300. I didn't know you could turn NFC off in the car settings, so I'm going to have to check that out as NFC does come up every time we place our iPhones in the charging cradle. It doesn't seem to affect Apple Play though. Ambient lighting looks great, no matter what color interior you get. I don't know how I've lived this long without such great ambient lighting in my car. It just puts a smile on my face and makes me want to drive at night much more! I can't offer any comment about Carvana, sorry. NFC can be turned off in the system menu. I leave it turned on because one gets the benefit of the vehicle's cellular antenna via NFC. One E300 issue I have is with the very noisy, underpowered engine. It lacks the oomph to quickly merge into traffic. The Tampa Bay area has very short merge lanes going into tightly spaced high speed (65+ mph) traffic. 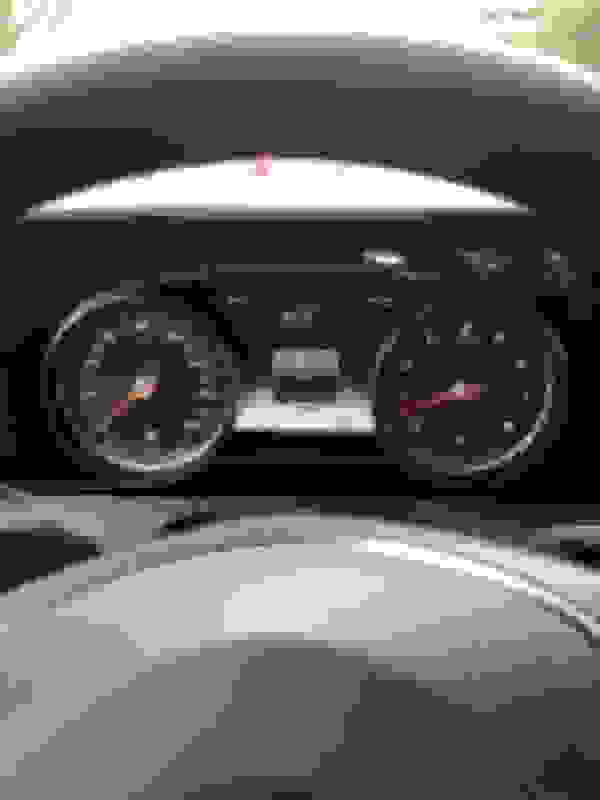 The E300 is 30% slower than the E400 (6.5 vs 5.0 seconds). I would have selected the E400 if it was available when I ordered my car in early 2017. Can you point to anything where it says the car benefits off the vehicle's cellular antenna via NFC? I don't see how that works at all. NFC is Near Field Communications. The cars cellular antenna should not be affected in the least by the NFC chip in the car. Great input! thank you all for responding. 3. Uncheck "NFC Surface Area Active"
As for Carvana, a buddy of mine just used them for his daughter's car (she turned 16). He swears by it now. He spent less than 15 minutes at a dealership. He did it all online, and then when you go to the store, you just wait for it to come out of the "vending machine". They give you some big token to put in and it goes and gets it. Kinda silly, but fun for sure. He did all the paperwork and stuff online and didn't hardly have to do anything there. There's also a 7 day guarantee for full refund, but I don't know the details on that either. I'm looking to get an E300 (or maybe E400) White/Beige. We'll see! I'll definitely keep you posted! I just went to the garage and turned off the NFC chip in my car. Maybe it's not a big deal, but now when I place my iPhone in the charging cradle it just starts charging and for whatever reason, Car Play started faster as well! Thanks so much! I posted it yesterday in the thread where you asked how to turn off NFC. I'm sure that you can find it. Basically the phone uses NFC to connect to the car's cellular antenna. It is called capacitive aerial coupling. I found it, thanks. The NFC chip does nothing to help cellular communications in the E Class in the US. For the US, NFC was not enabled to do what it does in Europe, including letting you use your phone as the Mercedes Key. I simply don't see any value in having NFC on in the car. And if you have an iPhone, the ONLY thing the NFC chip is capable of doing is communication with NFC payment systems. That's it. Last edited by rbrylaw; 08-06-2018 at 02:25 PM. I found it, thanks. The NFC chip does nothing to help cellular communications in the E Class in the US. For the US, NFC was not enabled to do what it does in Europe, including letting you use your phone as the Mercedes Key. I simply don't see any value in having NFC on in the car. I just test drove a 2017 and the option to disable NFC is not on the menu like it is on the 2018+. The salesmen said the techs no how to do it, but he was also probably just trying to sell me the car. I wouldn't let that one feature stop me from buying the car if it had most of what you want and is in really good condition. The worst you'll have is an iPhone (if you're an iPhone user) show the Apple Pay screen when you put the phone in the charging cradle. The phone screen goes dark within 30 seconds, and you drive around and do as you want regardless. Agreed. It's not a make or break issue. The car I found is Blue/Beige with 9k miles, panoramic roof, P1, AMG (Sport Body Styling, Sport Interior, Sport Interior (P15), Perforated Front Brake Discs & Fr Brake Calipers), Burmester Surround, NATURAL GRAIN BLACK ASH WOOD TRIM, etc. MSRP was $64 and they're asking $48 for CPO. (Nov 2017 - Nov 2022 CPO coverage). I'm very tempted... Trying to go slowly with the process though. Sounds like a great car! Let us know what you wind up doing. And of course pictures are required if acquired! You bet! I'd post a link to it, but don't want someone else to buy it. haha. When/if I get it, I'll post a lot of pics. I really liked the e300. Smooth good handling and good power. I recommend however you hold out for one with the dual screen option. The cars control systems were designed with the big screen in mind and are a notiably clunkier without it. Plus, it looks much better. In the cars without it the mixture of center screen plus gauges looks pretty awkward. The lack of the dual digital screen wouldn't and DIDN'T disappoint me to NOT have the dual screen option in my brand new E400 I picked up this weekend. I actually like the combination of analog dials and the digital screen. I totally don't agree the analog dials on one side and digital infotainment screen on the other is awkward looking in the least. Can you honestly tell me you think this is awkward looking? 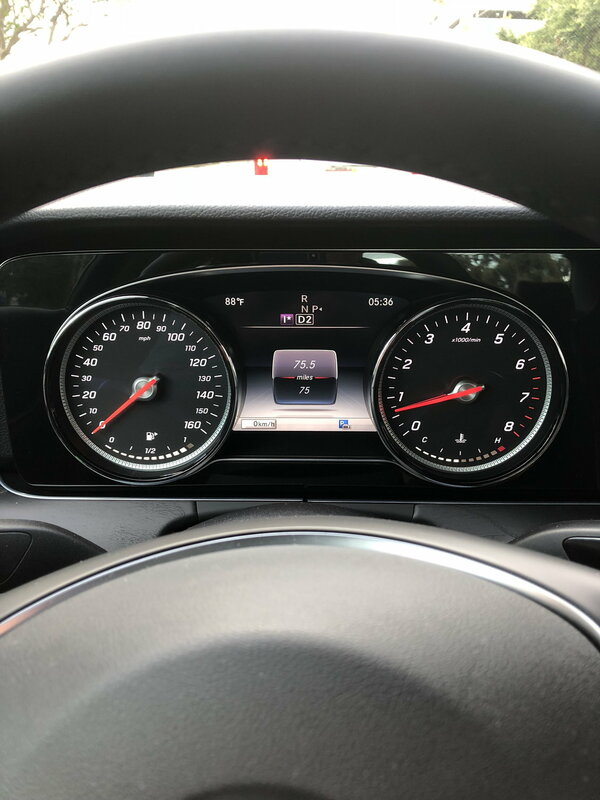 The dials take the exact same amount of space as the all digital cluster and are actually framed really nicely, giving some added visual interest to an otherwise flat panel. Last edited by rbrylaw; 08-06-2018 at 05:07 PM. Holy cow... that pic exemplifies why I want this car. Let's face it. That's the part of the car we see the most! No other interior approaches it IMO. Again, demonstrating the analog gauges DON'T look awkward, here are two pictures I took on my way home from work just now. To my eyes, it's classy, elegant, balanced and I'm quite happy with the look. Looks awkward to me. The center stack is sleek and modern whereas the gauge stack looks old and dated. It's a lot like an old BMW gauge cluster I had back in the 90's. I guess that's why they say opinions are like A-Holes. Everyone has one! Here's the BMW 5401, the direct competitor to the E Class and guess what? It still has analog gauges. There is nothing wrong with analog gauges. I'm happy for you that you got the all digital cluster, but please don't denigrate other's who didn't or don't. Last edited by rbrylaw; 08-06-2018 at 07:26 PM. Can you honestly tell me you think this is awkward looking? You asked for opinions, so that's what you got. Analog gauges look awkward in a digital dash. The BMW 540i interior with analog gauges and a display tacked on the dashboard as an afterthought is why I did not buy one.